Smoky Mountain Fall Colors: The Glory of America! Hikers, bikers, photographers, sightseers, and writers make their way into the Smokies to partake of nature's finest Fall show. Hiking trails, bicycle trails, and scenic roadways provide glorious views of brilliant shades of yellow, orange, and gold as sugar maple, scarlet oak, sweetgum, yellow birch, red maple, dogwood, sourwood, maples, sassafras, and hickory trees change from their summer garments into glorious fall attire. The National Park contains an amazing diversity of trees. Approximately 100 species of native trees thrive in the Smokies with the vast majority being deciduous. Sparkling clear water rushing through mountain rivers amidst a backdrop of majestic color provides a picture perfect adventure through the forest. For those who prefer to enjoy the majesty of fall from their vehicle, scenic drives are available inside the park. Some of the most photographed areas in Great Smoky Mountains National Park during the fall season include Cades Cove, Little River Road, Balsam Mountain, Campbell Overlook, Roaring Fork Motor Nature Trail, Foothills Parkway, Little Greenbrier School, Clingmans Dome, Cataloochee Overlook, Parson Branch Road, and Morton Overlook. 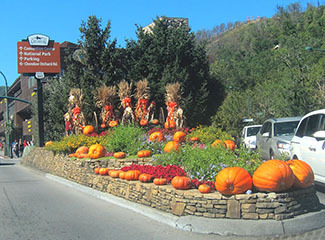 The hill towns surrounding Great Smoky Mountains National Park are thick with creative arts, rural beauty, cultural diversity, and great music and restaurants fueled by the area's amazing fall harvest festival. 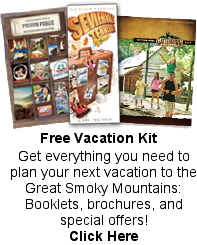 One of the most celebrated festivals in the Smoky Mountains region is Smoky Mountain Harvest Festival. The 20th annual festival kicks off on October 1, 2017 with special activities throughout Sevierville, Pigeon Forge, Gatlinburg, and Townsend. You will hear some of our nation's best gospel singers at Dollywood's National Music & Harvest Festival as you enjoy meandering throughout the park with aromas of hot apple cider and down home cooking. Outstanding artisans will showcase their works at the Gatlinburg Craftsmen's Fair and at the Rotary Club's Crafts Festival in Pigeon Forge. Other special events include Heritage Days, Taste of Autumn, and Robert A. Tino's Smoky Mountain Homecoming. Experience OctoberFest at Ober Gatlinburg with a fantastic festival featuring Bavarian-style food, drink and music. The Bavarian Fun Makers Band, in authentic costumes, will perform traditional Bavarian folk dances, schuhplattling, oompah music, sing-a-longs, yodels and more with daily shows and multiple performances every day during Oktoberfest.